When you first learn how to gather you usually learn to do basting stitches and pull them. And even if you do two rows, and are super careful, threads still break. So frustrating! This cheater gathering technique is genius and makes gathering yards of even the heaviest fabrics a cinch. It’s my go to method for gathering skirts for dresses, costumes and even home decor projects! Pretty much anything larger than a puffy sleeves get’s this gathering method in my book. 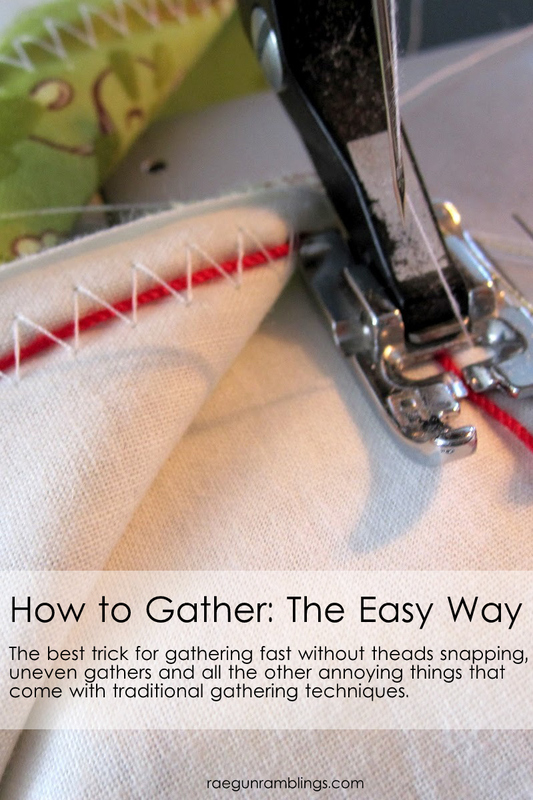 Learn how to gather with this easy trick! Sewing rope or clothesline can be meditative as well as help create amazing projects like this one! Check out how to sew rope in this tutorial. A few months ago a friend was complaining about the hours she had just spent trying to turn a bunch of thin fabric straps she was using for a DIY project. If only she had known about my absolute favorite sewing tool ever. It’s a loop turner. And seriously it’s the magic wand of sewing. One of the main tricks it can help with is quickly and easily turning fabric straps BUT it does so much more as well. See how to use a loop turner for turning fabric straps and tubes and check out all the other cool things you can use it for! If you don’t already use one in your regular sewing life you are missing out. Learn how to easily turn long sleeve shirt into short sleeve ones! This is a great tutorial for getting extra wear out of kids clothing or even for taking advantage of off season sales! See how to alter sleeves at Rae Gun Ramblings. Can’t find the perfect fabric for your project? No worries you can use heat transfer vinyl to MAKE your dream fabric. If you haven’t tried this stuff, it’s washable vinyl that you can iron onto fabric. You can make the ultimate fan inspired creations all the way to sporting necessities. This little technique is one of my all time favorite tricks to sprucing up my handmade creations. Learn How to Use Heat Transfer Vinyl at Rae Gun Ramblings! Did you know that you could print directly on fabric from your home computer? That’s right, you can! The Sewing Loft has mapped out 5 easy methods for you to print fun notes, labels and more onto your fabric of choice right from your desktop. It is much easier than you think. If you like the look of quilting, you’ll love HST’s. With a few simple tricks, these little squares of goodness are a snap to make and The Sewing Loft has broken it down for us. Learn different techniques to make half square triangles fast and accurately. Just think of all the ways you can use up leftover fabric scraps with these pretties. We all love zipper pouches but for many, the thought of sewing zippers is scary. To help us push past the fear, Scrappy Girls Club has put together a great post with tons of zipper sewing tips and tricks. For example: Did you know that these is a narrow zipper foot? This special presser foot is even smaller than the standard zipper foot and allows you to get up close & personal with your zipper teeth. Once you’ve mastered zipper installation be sure to check out the amazing round up of free zipper bag patterns. Learn more about this and other zipper sewing tips here on Scrappy Girls Club. It’s that time of year when we open the windows, clear out the clutter and begin to clean our personal space but what about our machines? With each stitch, small fibers break off and build up on the inside of our machines. Overtime, these fibers can cause havoc under the hood of our machines. So, it’s important to take a few minutes and clear these out. Not only will a few extra minutes keep our machines purring like kittens every time we turn them on but basic sewing machine maintenance can extend the life of our machines. Not sure where to begin? The Sewing Loft has a great step by step tutorial for general maintenance. So consider this our Public Service Announcement to you and be sure to check under the hood to clear out those dust bunnies!